Pregnancy is one happy phase of life where to be mothers take a lot of stress on their body and mind in the process of bringing a new life into the world. Labor pains and childbirth is a second life for all mothers out there. Stretch marks are another side effect of pregnancy that all mothers deal with. They are just not on belly, but stretch marks could be formed on a lot of other parts of the body such as buttocks, thighs, breasts and back due to changes in body weight during the pre and post pregnancy period. Some choose to live with them and others make an effort to reduce them post delivery; however it is important to know that the process of minimising stretch marks need to start as soon as the uterus and skin starts to stretch in order to accommodate the growing baby. Staying Hydrated: Keeping the body optimally hydrated is important at any point of time and pregnancy demands more care while catering to the body’s hydration levels. Skin goes through a lot of changes during these nine months and to be mothers need to consume ample amounts of water. Do not limit to 3 to 4 litres every day, but drink as much water as the body needs. It is also helpful to include a lot of fruits and vegetables that have high water content such as watermelon and cucumber. Fruit juices also will help in keeping body hydrated. This in turn helps in keeping the skin healthy and supple with minimal stretch marks to deal with. Keep a tab on body weight: Uterus and skin around the belly will certainly stretch for growing foetus, but overall body weight need not increase in the same pace. It is important to eat healthy and more during pregnancy; however one needs to choose a balanced diet and include less calories and fats in their diet. There are some high calorie foods such as ice creams, pizzas, pastries and so on that could be replaced with healthy salads, fish, whole grains, nuts and a lot of fresh fruits and veggies. It is essential to maintain a manageable body weight during pregnancy that helps in easy delivery and does not add to further complications. This also helps the body to go through less body weight fluctuations during pre and post pregnancy that in turn reduce stretch marks. Exercise: Physical exercise and yoga during pregnancy is recommended by many doctors as it helps in not only keeping tge body weight in control but also eases labour process. One other advantage with regular exercise during pregnancy is that it keeps the skin healthy with oxygen reaching to every cell. It also makes the body and mind relax that increases Endorphins levels in the body that makes skin to relax from inside. It helps in less stretch marks; however one needs to take medical advice before and while exercising to rule out any further issues with pregnancy. 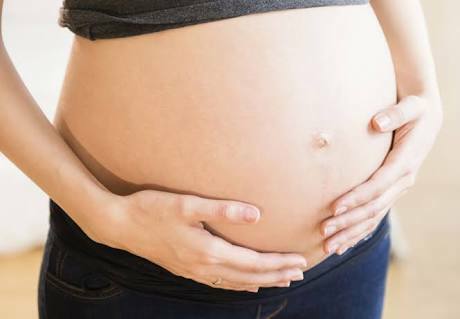 Moisturize: The skin tends to feel dry due to constant bodily changes in the pregnancy phase. Keeping the skin moisturized is one important step in minimizing stretch marks post delivery. Use a good moisturizer and apply it immediately after taking bath for best results. This puts less pressure on stretching skin and reduces permanent scars. Stretch marks are signs of stress that skin goes through during pregnancy, but it is not necessary to scar body forever. A stitch in time saves nine, and proper care during pregnancy will help in forming less evident stretch marks that in turn call for less stress and energy while dealing with them.